​Closed Sun-Wed, except for Classes, Movies and Events. The Lobby Gallery is also open during all public classes, events, and performances. Lisa and Ryan Davenport have both been creative people from an early age. It wasn’t until their honeymoon in 2014 that their creative spark was reignited on their visit to artist Alex Grey’s Chapel of Sacred Mirrors (CoSM) retreat in upstate New York. Lisa is a nurse by day and artist by night, while Ryan is a buyer by day and musician/artist by night. As with their day jobs, their approach to art is different but the devotion to create is strong. Their artistic evolution has culminated in an eclectic collection of paint on canvas over the last 3 plus years. They would like to share the pigments of their imagination with you. 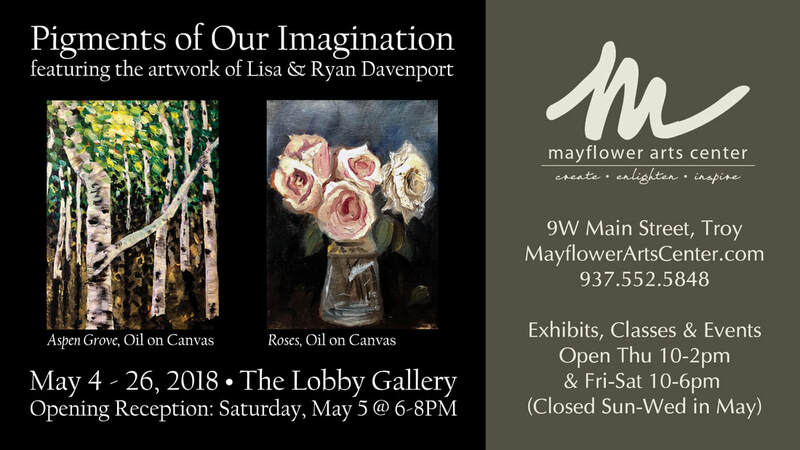 The Mayflower Arts Center provides a community-friendly environment to create art, and enlighten and inspire a deeper appreciation of art among artists and patrons. Located prominently on the vibrant downtown square of Troy, Ohio—in the historic 1928 Mayflower Theater building— the Mayflower Arts Center offers gallery and exhibit spaces, classes and workshops, indie/art films, fine art retail, art lectures, performances and concerts. The Lobby Gallery presents work from local, regional, and national artists throughout the year. Gallery Hours are Thursday 10:00 AM - 2:00 PM, Friday - Saturday 10:00 AM - 6:00 PM. The Lobby Gallery is also open during all public classes, events, and performances.